Now Revised for easier preparation! I have tried different kinds of holistic treats, which I still consider a good choice, provided your Bull Terrier does not have any issues with microorganisms (yeast) or her weight. Even many holistic treats contain large amounts of starch and sugars. There are differences in carbohydrates (“good” and “bad” ones). But even if they come from healthy sources, such as honey, it’s still carbs and bacteria or fat pads don’t care if the carbs/ sugars are organic or not. After some research on the Internet and then came up with my own recipe, which turned out pretty good at first. Only the preparation process was a little bit tedious in the past and I’ve successfully tried to improve that process, too. This is the revised version of my popular Carrot Coconut Mini Cookie recipe. Not only the way to a man’s heart is through his stomach. 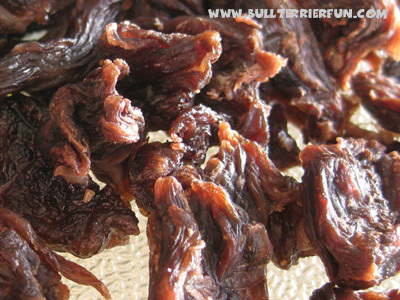 The way to a dog’s heart goes the same way with healthy dog treats and balanced nutrition. I sometimes wonder when I watch many people treating their dogs generously with pieces as big as half a meal. When doing dog training you really learn to divide your treats, because otherwise you will be feeding your dog fat in no time. There’s nothing wrong with feeding treats, as long as they do not add calories in excessive amounts or if they are just being “burned” by some additional exercise. Dogs have quite sensitive tastebuds. So, small treats even for big dogs are really doing the trick. This way they add less calories to the dog’s daily calorie intake. Still, if you are using a lot of treats, for example in dog training, it’s not the worst idea to really count the amount of treats into your dog’s daily calorie intake. Especially when your filling is quite fluid, it may become hard to fill dog treat balls with two openings, such as the Kongs, for example, for freezing. 2. Place your ball in the center, so you can completely cover it with the wrap later and tightly wrap the foil around the smaller hole of the ball. 3. Set the wrapped end of the ball in a coffee cup to make it stand upright and prevent it from tipping. Make sure that the hole at the bottom of the ball is still covered tightly! First cover the smaller hole with wrap and place the ball in a coffee cup with the smaller end/ hole at the bottom. During the last years there has been a lot of discussion about treats for pets, mainly because imports from Asia are still skyrocking. A lot of different types of treats have triggered warnings and even recalls. But not only questionable ingredients in or methods of preserving pet food are reason for concern. Rawhide dog treats are a very popular dog treat for chewing and available in all kinds of sizes and shapes. 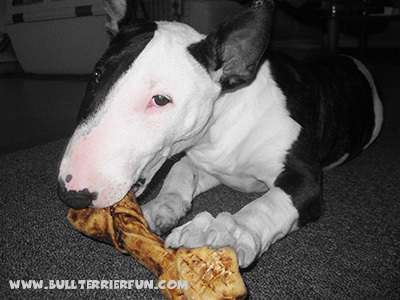 As many Bull Terriers like chewing a lot, especially the young ones, Rawhide dog treats can be a good choice to keep them busy. What are Rawhide dog treats made of? As the name suggests rawhide is made from hides – mostly cattle. The hides are freed from all fat, meat and hair, cleaned, cut, pressed and processed into different shapes, such as sticks, braids, knotted bone shapes etc. before drying. After drying the product has shrunken to about half of its former size, which is one of the major reasons, why rawhide treats bear the potential of causing intestinal blockages and choking. Some also come with chicken or beef flavoring. Careful with those: They can stain carpets and floors. … and will keep your English Bull Terrier busy for some time. There are some dog toys on the market that are prepared to be stuffed with treats. Some only offer the possibility to stuff in very tiny amounts and some allow only one kind of treat to be stuffed inside. 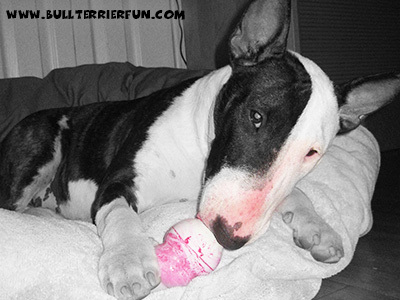 Many of those toys also have edges and slots that will encourage the Bull Terrier to rip and chew on them to get the treats out of them. I don’t consider this kind of stuffable toys a wise choice – I think the reasons are obvious.